The potato (Solanum tuberosum) is an herbaceous annual that grows up to 100 cm (40 inches) tall and produces tubers, which are botanically thickened stems that are so rich in starch that they rank as the world's fourth most important food crop, after maize, wheat and rice. The potato belongs to the Solanaceae, and shares the genus Solanum with at least 1,000 other species, including tomato and eggplant. S. tuberosum is divided into two, only slightly different, subspecies: andigena, which is adapted to short day conditions and is mainly grown in the Andes, and tuberosum, the potato now cultivated around the world, which is believed to descend from a small introduction to Europe of andigena potatoes that later adapted to longer day conditions. Potatoes will grow on most soils, organic as well as mineral ones. But, light and medium texture soils are recommended where mechanical harvesting is practiced, to avoid difficulties in harvesting when weather conditions are adverse at harvest time. Lowest possible soil pH is 5.5. Soil pH below 4.8 generally results in impaired growth. Too alkaline conditions can adversely affect skin quality and can induce micronutrients deficiencies. Potatoes are sensitive to the chloride anion. Chloride damage is manifested by scorching of the leaf tips and margins, and leaves yellowing and distortion. Fertilization with chloride-free fertilizers will, therefore, contribute to increased yields and to the improvement of their quality. “Hollow Heart”, by comparison, is characterized by formation of a cavity near the tuber centre, without any external indication of this syndrome. It is the result of soil boron deficiency. Rapid growth of the tuber, sometimes due to too low plant density, may cause this syndrome, too. “Black heart” symptom of potatoes is caused by a limited supply of oxygen to the tubers during their storage, and cannot be alleviated by improved growth conditions. During the early growth phase, until tuber formation, it is essential to keep the soil constantly and uniformly wet to a depth of at least 10-15cm. The frequency of irrigation cycles during this period should be determined according to the specific soil type and climate conditions. During the second growth phase, during tuber development, irrigation will be less frequent and applied once every 3-5 days. This allows efficient root respiration and intensifying growth rate. 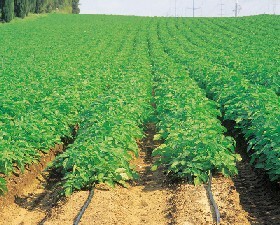 Potatoes can be irrigated almost until harvest. Potatoes are consumed fresh, and are being processed to chips and crisps. Potatoes are also used for the production of starch. Selected plots are grown for seed production. Potatoes grown for processing are valued for yield, size, shape, and mainly for dry matter content (measured by specific gravity). As the specific gravity increases, the water content of the potato decreases, improving the frying properties and flavor. Management factors, including plant nutrition treatments, will influence potato yield, quality, and storage properties. Potato growth is classified into five distinct growth phases (Fig. 3). The exact timing of these growth phases depends on many environmental and management factors that vary between locations and cultivars. However, these distinct stages of growth need to be considered when managing the crop. The nutritional requirements of the developing potato change during the growing season. Sprout develops from eyes on seed tubers and grows upward to emerge from the soil. Roots begin to develop at the base of emerging sprouts. Leaves and brunch stems develop from aboveground nodes along emerged sprouts. Roots and stolons develop at below-ground nodes. Photosynthesis begins. Tubers form at stolon tips but are not yet appreciably enlarging. In most cultivars the end of this stage coincides with early flowering. Tuber cells expand with the accumulation of water, nutrients, and carbohydrates. 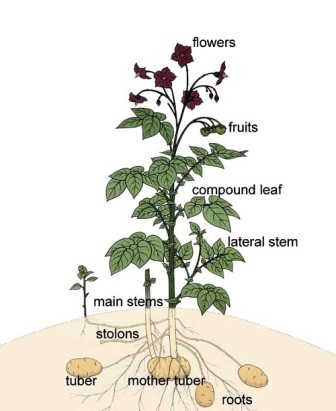 Tubers become the dominant site for deposition of carbohydrates and mobile inorganic nutrients. Vines turn yellow and lose leaves, photo-synthesis decreases, tuber growth slows, and vines eventually die. Tuber dry matter content reaches a maximum and tuber skins set.